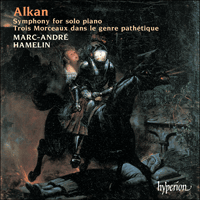 Marc-André Hamelin's first solo Alkan recording (CDA66794) met with the most superlative critical reception imaginable (culminating in Fanfare magazine's "one of the best releases of anything to have been made, a classic of the recorded era"). This follow-up proves to be no less spectacular. The disc is framed by two of the 'monster' works for which Alkan is notorious. The four movements of the Symphony for solo piano are taken from his magnum opus, the 12 Studies in the minor keys Op 39. This piece has become one of Alkan's best known but never has its finale (once described as a 'ride in hell') been so spectacularly thrown off. The Trois Morceaux dans le genre pathétique are the earliest pieces in which Alkan's true personal style became apparent. These are three massive studies each with programmatic titles and an atmosphere of Gothic horror that requires a supreme virtuoso to tackle their outlandish technical demands. This is their first recording. The recital is completed by three pieces of rather religious inspiration. While their scale and technical demands are those of a more conventional composer, their quirky sound-world and often sardonic mood confirm the composer as our reclusive Frenchman. Published by S Richault in 1837, Alkan’s Douze Grands Caprices ou Etudes—also titled Douze Caprices or Etudes-Caprices—comprise four groups of three pieces each, Opp 12, 13, 15 and 16. They constitute the composer’s first truly personal composition. Then aged twenty-four, he had previously published nothing more than a few glitzy but unremarkable pieces, with the exception, perhaps, of the two Concertos da camera. The 1830s marked the first real pinnacle of his career, which was to be destroyed in 1839, probably as the result of the birth of an illegitimate son—E-M Delaborde. The twelve Caprices bear witness to the musician’s private exploits and illustrate the way in which he seemed to be forever amassing problems in his life. According to Ronald Smith, these pieces mark the emergence of their author’s style: a mood of gloom and obsession, rhythmic fireworks, a taking-over of the entire keyboard, and an intense virtuosity—all features which Alkan would later incorporate into his works in a much more skilful, sparing and inspired manner. Throughout the course of the four sets of pieces, a great variety of moods is to be found: the Trois Improvisations dans le style brillant (Op 12) are brief, brilliant, and a little superficial; the Trois Andantes romantiques (Op 13) unfold lyrically in an atmosphere which at times seems unrelenting; the Tre Scherzi (Op 16) are overflowing, at times almost overladen, with extraordinary rhythmic effects. As for Souvenirs: Trois Morceaux dans le genre pathétique (Op 15), this collection contains the longest pieces, the most deliberately romantic, the most difficult to play, and the only ones to have been given individual titles. What is the significance of these titles? Britta Schilling-Wang is inclined to believe that they have a religious dimension (particularly ‘Aime-moi’ and ‘Morte’), although one might also choose to see in them a profane programme similar to that of Berlioz’s Symphonie fantastique, a kind of ‘moving memories of an artist’s life’. The fact that the main theme of ‘Aime-moi’ returns at the end of ‘Morte’ would seem to reinforce the cohesiveness of the collection, leading one to suspect that the work was intended as a continuous whole rather than as a set of extractable, individual pieces. One need cast no more than a cursory glance over this collection to get the picture of this Neo-Frenchman’s taste: it smacks of Eugene Sue and G Sand. One finds oneself similarly gripped by the lack of art and real life. At least Liszt caricatures intelligently; and Berlioz, in spite of all his aberrations shows signs from time to time of having a human heart; he’s a libertine, full of strength and daring. But here we find little more than frailty and a vulgarity devoid of any imagination. The studies have titles—‘Aime-moi’, ‘Le vent’ and ‘Morte’—and are distinguished throughout their fifty pages by a deluge of notes and a lack of even the slightest indication of performance markings; one cannot blame the capriccio itself for this, especially as we know, in any case, how to play this kind of piece; but in this instance, where the inner futility of the work sparkles alongside its apparent emptiness, what more could we expect? In ‘Aime-moi’, we have an uninspiring French melody and then we digress in ways which have absolutely nothing to do with the title; in ‘Le vent’, there is a chromatic moaning over a theme from Beethoven’s Symphony in A major; and in the last piece we are faced with an endless boredom out of which nothing ever emerges except images of wood and sticks and strangulation, this latter idea being borrowed, what is more, from Berlioz. We may choose to protect talent when it loses its way, but there has to be some kind of demonstration of musicianship; if even that becomes questionable and if we can no longer make out anything more than layers of darkness beneath darkness, then we are forced to turn our backs, unmoved. One might have expected more perception from Schumann who himself had just written a set of variations on the theme of the Allegretto from Beethoven’s Seventh Symphony, those variations being peppered with quotations from works by the deaf master. As for the idea ‘borrowed from Berlioz’, this relates quite simply to the ‘Dies irae’, a theme composed appreciably earlier than the Symphonie fantastique! In January 1836 Liszt, who was teaching piano at the newly established Geneva Conservatoire, had to find a replacement for Wolff who had been acting as his assistant. He offered the post to Alkan who turned it down. That Liszt should have considered taking on his French colleague to teach at his side would seem to be a sign of exceptional respect. Furthermore, there is a copy of the score of Alkan’s Impromptu sur le Chorale de Luther (Op 69) containing a dedication to the Hungarian pianist: ‘To Abbé Liszt from his old and elder friend Alkan, 6/5/66’. And yet, in his letters to Ferdinand Hiller in the 1850s, the French musician cannot resist passing comment on the Hungarian’s aesthetic evolution and on 17 December 1865 writes: ‘What do you think of the way our old friend Liszt is going off in a new direction? For my part, if I ever become a rabbi, I will never accept the post of music master in the synagogue, but will put on my rabbi’s robes with total disinterest; but if it was once worth a man’s while to convert to Catholicism in order to gain sovereignty over Paris, then perhaps it is worth donning a cassock in order to gain directorship of the choir school of St Peter’s’. In 1837 all this was still in the future of course, and Liszt’s opinion of Alkan is notably more laudatory than Schumann’s. He affirms at once that: ‘Monsieur Alkan’s capriccios, which I have read and re-read many times since the day when they first gave me such a sweet sense of joy, are as distinguished as any composition could be, and, all bias of friendship aside, are the sort of music which should awaken great interest amongst musicians’. ‘Aime-moi’, in A flat minor, opens with a beautiful melodic phrase of a truly Chopinesque Romanticism. The dialogue grows increasingly lively, the writing quickly becoming immensely difficult, such that Ronald Smith was moved to write that certain passages were seemingly written for an extinct race of seven-fingered pianists! Whilst it is scarcely ever played these days, ‘Le vent’ was for a long time quite a popular work—so much so that Sorabji wrote that it was ‘too familiar one is tempted to say, for most people think of Alkan, indeed only know him, as the composer of “Le Vent”, as they know only the Sibelius of the Valse Triste or Finlandia’. For Liszt’s taste, ‘Le vent’ ‘is the most Romantic of the three. By means of an uninterrupted explosion of chromatic semiquavers, the composer has managed wonderfully to bring to life the effects of those sustained winds which blow for days on end, making the forest heather and grasses moan monotonously. One can almost hear the rain trickling down the oak trees’ trunks, and, in great reverence, one can listen to the tune which floats above all these subdued murmurings, like the song of the lover or the poet as he looks upon Nature’s sorrow yet without feeling that sadness in himself because he holds in his heart the gentle glow of a memory or a hope’. Larry Sitsky adds: ‘A “normal” Romantic would seize the opportunity for whipping up a veritable gale; in Alkan’s piece, the rise and fall of the wind is monotonously regular, the melody heard through it pathetic rather than heroic’. (Alkan was to come back to this meteorological theme in the first of the twelve Etudes dans tous les tons mineurs Op 39, entitled ‘Comme le vent’—a work which in Sorabji’s opinion was far less successful.) The score is pretty striking in itself: the page is dominated by a huge pile-up of notes—repetitive scales of demisemiquavers—and the visual impact is almost as striking as the impact the music makes as sound. We have the same sort of effect in some of Chopin’s Etudes. The middle section is undoubtedly the most lyrical and the most beautiful; the combination of tremolos and chromatic scales flashing in the left hand evokes Chasse-neige, the last of Liszt’s Etudes d’exécution transcendante, without giving us a clue as to who influenced whom. ‘Morte’, in E flat minor, is the most premonitory of the three works. Sorabji believes that this is the ‘most remarkable piece of the collection … “Morte” is a moving and tragic elegy, a funereal song, in which the composer introduces the Dies irae, that marvellous theme which has for so long haunted and fascinated so many of the great masters of music. The work is bursting with extraordinary daring—technical, pianistic and harmonic—and its close is as weirdly uncanny as it is audacious and original’. In contrast to Sorabji’s words, it is this third piece that finds Liszt at his most scathing: ‘In the ensemble of this piece, which contains some truly lovely things, it seemed to us that M Alkan had too little concern for detail. The transition passages, thrown like bridges between one idea and another […] have been somewhat neglected. It is evident that the composer views them as being of mediocre importance. And that is a mistake. One should never assume that certain sections will benefit through a neglect of others’. On listening to the work, however, this criticism seems somewhat ill-fitting. The music begins with bare fifths in the piano’s lower register, and then the theme of Dies irae comes soaring over the top, until a savage torrent of chords adds a certain violence to the desolation. There follows a magnificent lament, leading into a florid cadence, and then on to a passage in which a repetitive B flat uncannily heralds ‘Le Gibet’ from Gaspard de la nuit by Ravel—who was familiar with Alkan’s music. The next section, which Liszt labelled ‘Presto finale’, is a violent expression of revolt and exasperation which then returns to the mood of despair with which the piece began. ‘Morte’ certainly reminds one of music by Berlioz, Mussorgsky and Ravel – but it equally well heralds the best of Alkan’s compositions still to come: ‘Prométhée enchaîné’ from the Grande Sonate, Op 33, La Chanson de la folle au bord de la mer from the Preludes, Op 31, Le Tambour bat aux champs, Op 51 No 2, for example. The absence of any indication of performance markings in the score could be regarded as a sort of homage to the person to whom it was dedicated. It does not help the task of the interpreter. In general, this collection represents a gauntlet thrown down to all pianists. Raymond Lewenthal rightly insisted on the need to play Alkan’s music strictly a tempo at the designated speeds and with total conviction, since this is not music which comes to life simply by reading it. Rather than taking the view of Ronald Smith, who claims that the technical expertise required to play Opus 15 is disproportionate to the musical rewards, let us listen to Marc-André Hamelin who, in his true re-creation of the work, takes initiatives which transform these pages. Alleluia, Op 25, appeared in 1844 in the Central Bureau of music. Alkan had been back on the scene for about a year and he seems to have written the work at the time of a concert given in the Salons Erard on 20 April 1844. Although it was conceived as a concert piece, Opus 25 takes us into a religious dimension which is ever present in the music of its maker. Let us remember that ‘alleluia’ means ‘Praise ye the Lord’, an exclamation which Alkan joyously highlights in this work which peals with enthusiasm and fervour. We continue in a religious vein with Super flumina Babylonis, Op 52, which was published in 1859 by Richault. The title is from Psalm 137 and the original edition is embellished with a translation into French of the Hebrew poem. Comparing this version with a dozen other translations available in Alkan’s time, the Domenican brother Michel Albaric draws some irrefutable conclusions: the text is unedited, but it has a strongly Protestant or perhaps Jewish flavour (containing as it does words like ‘The Eternal’ and the use of the familiar rather than formal word for ‘you’). This leads one to suppose that the translation is Alkan’s own. And so we have a remnant of the complete translation of the Bible which Alkan admitted to having made but which he undoubtedly destroyed. He wrote, for example, to Ferdinand Hiller on Saturday 21 August 1858: ‘Moreover, I’m still doing my Semitic Studies, as you call them, my dear, mocking friend. I mean by that that I copy out and translate three or four verses every day. Now, as the days have been adding up, I have thus already done more than three quarters of the Bible for my own use. I try my hand too, sometimes, at translating bits of poetry; though, after great effort, I often have to give up on this. For want of other forms of pleasure, at least I have the pleasure of sometimes finding that other peoples’ efforts are even less fruitful than my own; although they are at least managing to publish theirs’. And on Thursday 3 January 1861 he wrote: ‘And as you were asking about my translation of the Bible, I will tell you that I’ve finished all the canonical books, and I’m now on to the Apocrypha. I’m finishing Ecclesiastes, and I’ll be starting Baruch next, God willing. It’s about the only thing that I do with any regularity, as well as my studies. Which is to say that I’m not doing anything of much worth, since this translation will have served no more than to stop me from admiring the translations of others: except perhaps Luther’s’. And to add to this extraordinary confession: ‘There are times when, if I had to start my life all over again, I would love to set the whole of the Bible to music, from the first word to the very last’. On 30 May 1865 he made a confession which is quite astounding for a practising Jew: ‘In beginning to translate the New Testament, I immediately had a strange feeling: It was that it seemed to me that in order to truly understand it, one has to be a Jew’. Musically, Super flumina Babylonis is a striking work in which Alkan represents the psalm quite faithfully. There are three sections to the piece: firstly a ‘Quasi Adagio’ in G minor, rich in markings such as ‘lamentevole’, ‘sostenuto in infinito’, ‘suavissimo’; this runs into harp-like effects in the left hand. After several passages of recitative we come to a ‘Vivacissimo’ in C major ‘con energia’; some more harp effects lead to the finale—‘Allegro feroce’ in G minor—in which the mood is one of incredible violence. Salut, cendre du pauvre!, Op 45, is Alkan’s only work to have been published in 1856. It is a paraphrase of a poem by Gabriel-Marie-Jean-Baptiste Legouve (1764–1812) to which it is difficult to assign any clear identity. As with the previous piece, but within a generally calmer musical landscape, several sections create a juxtaposition of contrasting atmospheres. The piece begins with a number of arpeggios and then goes on to introduce a pregnant theme which then filters through the entire work. There follows a page in a much more funereal mood reminiscent of the Marche funèbre (Op 26) with its obsessive throbbing in the left hand. The piece comes to a calm close with big spread chords. After the setback when he failed to gain the post of professor of piano at the Paris Conservatoire as Zimmerman’s successor, Alkan again began to withdraw more and more from public life. In 1857, Richault brought out an entire collection of exceptional works which included Alkan’s magnum opus, the twelve Etudes dans tous les tons mineurs, Op 39, dedicated to the Belgian musicologist François-Joseph Fétis, who wrote: ‘this work is a real epic for the piano’. The huge collection sums up all the composer’s pianistic and compositional daring and it comprises some of his most famous works, none more so, perhaps, than Le Festin d’Esope, a set of variations which completes the cycle. We find here the famous Concerto for solo piano, of which the first movement alone is one of the great monuments of the piano repertoire, and the Symphony for solo piano, which constitutes studies 4 to 7 and is written on a far more ‘reasonable’ scale. The lack of cohesion which might result from the progressive tonality of its four movements is compensated for by the many skilfully concealed, interrelated themes, all examined in great detail by several writers, among them being Larry Sitsky and Ronald Smith. One could discuss ad infinitum the orchestral quality of pianistic writing, particularly in the case of composers like Alkan and Liszt who, moreover, made numerous successful transcriptions. Harold Truscott seems to sum up the matter very well in saying that what one labels ‘orchestral’ within piano music is most often ‘pianistic’ writing of great quality applied to a work of huge dimensions which on further investigation turns out to be extremely difficult to orchestrate. Jose Vianna da Motta found just the right words to describe the vast first movement of this symphony: ‘Alkan demonstrates his brilliant understanding of this form in the first movement of the Symphony (the fourth Study). The structure of the piece is as perfect, and its proportions as harmonious, as those of a movement in a symphony by Mendelssohn, but the whole is dominated by a deeply passionate mood. The tonalities are so carefully calculated and developed that anyone listening to it can relate each note to an orchestral sound; and yet it is not just through the sonority that the orchestra is painted and becomes tangible, but equally through the style and the way that the polyphony is handled. The very art of composition is transformed in this work’. The second movement consists of a Funeral March in F minor, rather Mahlerian in style. In the original edition the title page read ‘Symphonie: No 2. Marcia funebre sulla morte d’un Uomo da bene’, words which have sadly been lost in all subsequent editions. Of course one is reminded of the subtitle of the ‘Marcia funebre’ in Beethoven’s third symphony. But might we not regard this ‘uomo da bene’ as Alkan’s father, Alkan Morhange, who died in 1855, two years before these studies were published? The Minuet in B flat minor is in fact a scherzo that anticipates shades of Bruckner—full of energy and brightened by a lyrical trio. The final Presto in E flat minor, memorably described by Raymond Lewenthal as a ‘ride in hell’, brings the work to a breathless close. The Symphony does not contain the excesses of the Concerto or the Grande Sonate. But, rather like the Sonatine Op 61, it proves that Alkan was also capable of writing perfectly balanced and almost ‘Classical’ works. Publiés en 1837 chez S. Richault les Douze Grands Caprices ou Études, encore qualifiés de Douze Caprices ou d’Études-Caprices constituent la première composition vraiment personnelle de Charles-Valentin Alkan. À 24 ans il n’a jusqu’alors publié que quelques pièces brillantes mais peu remarquables, à l’exception peut-être des deux Concertos da camera. Les années 1830 marquent un premier sommet dans sa carrière, qui va se briser en 1839, probablement à cause de la naissance d’un fils naturel: E-M Delaborde. Les 12 Caprices portent la trace des exploits du concertiste qui accumule à l’envi les difficultés les plus ahurissantes. Ils marquent, ainsi que l’écrit Ronald Smith, la cristallisation du style de leur auteur : climats lugubres, obsessionnels, feux d’artifice rythmiques, prise de possession de tout le clavier, virtuosité exacerbée, toutes choses qui seront ultérieurement mises en œuvre avec certes davantage de métier, d’économie voire d’inspiration. Les climats les plus variés règnent parmi ces quatre cahiers: les Trois Improvisations dans le style brillant op. 12 sont brèves, brillantes et un peu superficielles, les Trois Andantes romantiques op. 13 évoluent dans un climat lyrique qui manque parfois de relief, les Tre Scherzi op. 16 regorgent, non sans quelque lourdeur, d’effets rythmiques extraordinaires. Quant à Souvenirs: Trois Morceaux dans le genre pathétique op. 15, ce recueil contient les pièces les plus longues, les plus délibérément romantiques, les plus difficiles et les seules à porter des titres. Que signifient ces titres? Britta Schilling-Wang penche vers une dimension religieuse, en particulier pour «Aime-moi» et «Morte», tandis qu’on peut aussi y voir un programme profane, semblable à celui de la Symphonie fantastique de Berlioz, sorte de «souvenirs pathétiques de la vie d’un artiste». Le fait que le thème principal d’«Aime-moi» se trouve cité à la fin de «Morte» renforce la cohésion du recueil et laisse penser qu’il est préférable de le jouer dans sa continuité plutôt que d’en extraire des morceaux. Un coup d’œil rapide sur ce recueil permet de se rendre compte du goût de ce néo-Français ; il sent l’Eugène Sue et le G. Sand. On reste saisi devant une pareille absence d’art et de naturel. Liszt caricature au moins avec intelligence ; Berlioz, en dépit de toutes ses aberrations, montre çà et là un cœur humain, c’est un libertin, plein de force et d’audace; mais ici, nous ne trouvons guère que la débilité et une vulgarité dénuée de toute imagination. Les études portent des titres: «Aime-moi», «Le Vent» et «Morte», et se signalent tout au long de leurs cinquante pages par un déluge de notes dépourvu de la moindre indication d’exécution; le seul caprice ne saurait en être rendu responsable, d’autant qu’on sait de toute façon comment exécuter au mieux une telle musique; mais cette fois, l’inanité intérieure brillant de concert avec la vacuité apparente, que peut-il rester? Dans Aime-moi, une insipide mélodie française et une digression centrale qui n’a aucun rapport avec le titre; dans Le Vent, un mugissement chromatique sur une idée tirée de la [7e] Symphonie en la majeur de Beethoven; et dans le dernier morceau, un indéfectible ennui d’où rien n’émerge sinon le bois, le bâton et les cordes de suppliciés, cette dernière idée étant en outre empruntée à Berlioz. Nous protégeons le talent qui s’égare, mais encore faut-il qu’il manifeste quelque sentiment musical; quand cela-même est douteux et que l’on ne distingue rien que du noir sous du noir, nous devons nous détourner sans indulgence. On aurait attendu davantage de pénétration de la part d’un Schumann qui a justement commis lui-aussi des variations sur le thème de l’allegretto de la 7e Symphonie de Beethoven, elles-mêmes truffées de citations littérales d’œuvres du «grand sourd». Quant à l’idée «empruntée à Berlioz», il s’agit simplement du Dies irae, thème sensiblement antérieur à la Symphonie fantastique! En contrepoint à cette «exécution», Souvenirs bénéficièrent d’une belle recension sortie de la plume de Franz Liszt, le dédicataire du cahier. Ce texte est doublement précieux car il représente le témoignage le plus important concernant les relations entre ces géants du piano. On sait que les deux artistes se connurent, s’estimèrent à l’occasion. Peu de traces survivent. Dans une monographie qui fit date, Alexandre de Bertha témoigne: «Alkan me raconta plusieurs fois combien il avait été affligé le soir où il y avait entendu jouer le jeune Franz Liszt dont la virtuosité, déjà étonnante, l’avait rejeté au second plan. Il en avait pleuré de dépit pendant toute la séance et la nuit suivante il n’avait pu fermer les yeux. Petite ‘tempête sous un crâne’ d’un adolescent, qui n’empêcha pas les bonnes relations ultérieures des deux rivaux momentanés. Elles subsistèrent jusqu’à la mort du ‘roi des pianistes’ qui n’omit pendant aucun de ses séjours à Paris de rendre visite à son camarade de jeunesse». En janvier 1836, Liszt, qui enseignait gracieusement le piano au tout récent Conservatoire de Genève, fut conduit à remplacer Wolff qui l’assistait: il proposa le poste à Alkan, qui refusa. Que Liszt eût songé à son collègue français pour enseigner à ses côtés me paraît une marque d’estime exceptionnelle. On conserve par ailleurs un exemplaire de la partition de l’Impromptu sur le Choral de Luther op. 69 d’Alkan portant un envoi manuscrit au pianiste hongrois: «À l’Abbé Liszt son vieil ami Alkan aîné 6/5/66.». Pourtant, dans les lettres qu’il adresse à Ferdinand Hiller dans les années 1850, le musicien français n’épargne pas l’évolution esthétique du Hongrois et le 17 décembre 1865, il ajoute: «Que penses-tu de la nouvelle évolution de notre vieil ami Liszt? Pour moi, si je me fais jamais Rabbin, je n’accepterai point de maîtrise de la synagogue, mais prendrai le froc d’une façon toute désintéressée; car, si Paris valait bien une messe, peut-être aussi la maîtrise de Saint-Pierre vaut-elle bien une soutane». «Aime-moi», en la bémol mineur, s’ouvre sur une belle phrase mélodique d’un romantisme tout chopinien. Le discours s’anime peu à peu, l’écriture devenant vite d’une immense difficulté ce qui fit écrire à Ronald Smith que certains passages étaient vraisemblablement destinés à une race éteinte de pianiste à sept doigts! Alors qu’il n’est presque plus jamais interprété aujourd’hui, «Le vent» a longtemps conservé une certaine popularité, à telle enseigne que Sorabji put écrire que cette pièce était «trop connue serait-on tenté de dire, dans la mesure ou la plupart des gens ne connaissent Alkan qu’en tant qu’auteur de cette pièce, de la même façon qu’ils ne connaissent que le Sibelius de la Valse triste ou de Finlandia». Pour Liszt, «le second morceau est le plus romantique des trois. Par des fusées non interrompues en doubles croches chromatiques, l’auteur a merveilleusement rendu les effets de ces vents prolongés qui soufflent durant des journées entières en arrachant aux bruyères et aux herbes des forêts une plainte monotone. On croit entendre la pluie ruisseler le long des chênes, et l’on écoute avec recueillement le chant qui plane au-dessus de ces sourds murmures, pareil au chant de l’amant ou du poëte qui assiste sans tristesse au deuil de la nature parce qu’il sent au-dedans de lui le doux rayonnement d’un souvenir ou d’une espérance.» Larry Sitsky ajoute: «Un romantique ‘normal’ saisirait l’occasion pour susciter un véritable coup de vent, tandis que chez Alkan les montées et chutes de vent sont d’une régularité monotone et la mélodie qui se dégage sonne pathétiquement plutôt qu’héroïquement.» Alkan reviendra à ce thème «météorologique» dans la première des 12 Études dans tous les tons mineurs op. 39 intitulée Comme le vent, que Sorabji jugeait d’ailleurs beaucoup moins réussie. La partition est déjà saisissante: Alkan répugne à toute abréviation ce qui provoque parfois comme ici des amoncellements de batteries ou de gammes de triples croches dont le dessin s’impose avant même la musique, comme en certaines des Études de Chopin. La section centrale est sans doute la plus lyrique et la plus belle ; la combinaison de trémolos et de gammes chromatiques fulgurantes à la main gauche évoque Chasse-neige, la dernière des Études d’exécution transcendante de Liszt, sans qu’on sache qui a influencé l’autre. «Morte», en mi bémol mineur, est la plus prémonitoire des trois œuvres. Sorabji estime qu’il s’agit de «la pièce la plus remarquable du recueil. […] «Morte» [est] une émouvante et tragique élégie ou chant funèbre, où l’auteur introduit le Dies irae, ce thème prodigieux qui a toujours hanté et fasciné tant de grands maîtres de la musique. L’œuvre abonde en stupéfiantes hardiesses, à la fois techniques, pianistiques et harmoniques, et sa conclusion est aussi étrangement inquiétante qu’audacieuse et originale.» A contrario, c’est au sujet de ce troisième volet que Liszt se fait le plus mordant: «Dans l’ensemble de ce morceau, qui contient de fort belles choses, il nous a semblé que M. Alkan était trop insoucieux du détail. Les passages de transition, jetés comme des ponts d’une idée à une autre […] sont un peu négligés. On voit que l’auteur les considère comme étant d’une médiocre importance. C’est là un tort; il ne faut pas croire que certaines parties gagnent à la négligence de certaines autres.» À l’écoute, la critique nous paraît pourtant porter à faux. L’œuvre s’ouvre sur des quintes à vide dans le grave du piano au-dessus desquelles vient planer le thème du Dies irae, avant qu’une brutale cataracte d’accords ajoute la violence à la déréliction. Une magnifique déploration s’ensuit qui conduit à une cadence virtuose, après un passage où un si bémol obsessionnel annonce invinciblement Le Gibet de Ravel—qui connaissait la musique d’Alkan. La section suivante, qualifiée de Presto finale par Liszt, exprime révolte et exaspération avec une violence prodigieuse avant un retour à la désespérance initiale. «Morte» fait bien sûr songer à Berlioz, à Moussorgsky, à Ravel mais annonce également les meilleures pièces à venir d’Alkan: Prométhée enchaîné de la Grande Sonate op. 33, La Chanson de la folle au bord de la mer op. 31, Le Tambour bat aux champs op. 51 bis par exemple. L’absence de toute indication interprétative dans la partition peut être retenue comme une sorte d’hommage au dédicataire. Elle ne facilite pas la tâche de l’interprète. De manière générale, ce recueil constitue un défi lancé aux pianistes. Raymond Lewenthal insistait avec raison sur la nécessité de jouer la musique d’Alkan au tempo et avec une conviction totale car cette musique ne se livre pas à la seule lecture. Plutôt que de suivre Ronald Smith qui affirme que les efforts techniques requis dans l’opus 15 sont disproportionnés avec les effets musicaux obtenus, écoutons Marc-André Hamelin qui opère une véritable re-création, prenant des initiatives qui transfigurent ces pages. L’Alleluia op. 25 parut en 1844 au Bureau central de musique; Alkan était revenu à la scène depuis environ un an et il semble avoir créé l’œuvre lors d’un concert donné dans les salons Erard le 20 avril 1844. Bien qu’il soit conçu comme une pièce de concert, l’opus 25 nous ramène à la dimension religieuse omniprésente dans la musique de son auteur. Rappelons qu’«alleluia» signifie «louez Yavhé», exclamation qu’Alkan souligne avec bonheur dans cette œuvre carillonnante pleine d’enthousiasme et de ferveur. Le dédicataire de l’œuvre nous conduit à d’autres considérations intéressantes. Le chanoine Robert-Auguste Latouche (1783–1878), qui utilisait le pseudonyme de Gohin de la Baudonnière, écrivit de nombreux ouvrages d’études bibliques et hébraïques. Ordonné prêtre en 1808, il enseigna la rhétorique au Collège d’Avranches, et prit un part active aux missions diocésaines organisées sous la Restauration. En 1824, il créa à Paris les premières écoles du soir pour les ouvriers et fut ensuite aumônier au collège royal de Strasbourg, puis principal à Colmar. Il quitta l’université en 1834 pour se consacrer à la prédication et à l’étude de l’hébreu. Il vint alors à Paris, enseignant cette dernière langue et différentes langues orientales ou européennes qu’il ramenait à l’hébreu par la comparaison des racines primitives. C’est probablement à cette époque que cet érudit entra en contact avec Alkan. Il prétendait que l’hébreu pouvait, aussi bien que le sanscrit, servir de point de comparaison pour l’étude des langues indo-européennes et il allait même jusqu’à lui rattacher le chinois et les idiomes océaniens. Ce système ne pouvait qu’engendrer des erreurs et des déceptions, car il ne s’appuyait guère que sur des analogies entre les sons des mots, sans avoir au préalable fixé les lois phonétiques qui furent à la base de toute la grammaire comparative. Musicalement, Super flumina Babylonis est une œuvre saisissante dans laquelle Alkan illustre fidèlement le Psaume. On peut distinguer trois sections: d’abord un Quasi-Adagio en sol mineur, riche en annotations telles que «lamentevole», «sostenuto in infinito», «suavissimo», qui débouche sur des effets de harpe à la main gauche; après plusieurs passage Recitativo, apparaît un Vivacissimo en ut majeur «con energia»; quelques effets renouvelés de harpe mènent au finale Allegro feroce en sol mineur, d’une violence inouïe. Salut, cendre du pauvre! op. 45 est la seule œuvre publiée en 1856. Elle paraphrase un poème de Gabiel-Marie-Jean-Baptiste Legouvé (1764–1812) dont l’identification exacte pose problème. Comme dans la pièce précédente, mais dans un climat général beaucoup plus apaisé, plusieurs sections opposent des climats contrastés. La composition commence par quelques arpèges avant que ne s’énonce un thème très prégnant qui irrigue toute l’œuvre. S’ensuit une page d’un climat beaucoup plus funèbre dont l’écriture rappelle celle de la Marche funèbre op. 26 avec les battements obsessionnels à la main gauche. La pièce se clôt dans l’apaisement sur de grands accords arpégés. Après son échec à la succession de Zimmerman au poste de professeur de piano au Conservatoire de Paris, Alkan se retire de nouveau progressivement de la vie publique. En 1857 paraît chez S. Richault tout un groupe d’œuvres exceptionnelles parmi lesquelles son opus maximum: les 12 Études dans tous les tons mineurs op. 39, dédiées au musicologue belge François-Joseph Fétis qui écrivit: «cet ouvrage est une véritable épopée pour le piano». Ce corpus gigantesque résume toutes les audaces pianistiques et d’écriture du compositeur et comprend quelques-unes de ses œuvres les plus célèbres, à commencer par Le Festin d’Ésope, pièce à variations qui clôt le cycle. On y trouve le fameux Concerto pour piano seul, dont le seul premier mouvement compte parmi les monuments de la littérature pianistique, et la Symphonie pour piano seul composée des études no4 à 7, de dimensions plus «raisonnables». Le manque de cohérence qui pourrait provenir de la tonalité évolutive des quatre mouvements est ici compensé par de multiples parentés thématiques habilement dissimulées, que plusieurs auteurs ont longuement détaillées tels Larry Sitsky ou Ronald Smith. On peut débattre à l’infini de la qualité orchestrale de l’écriture pianistique, particulièrement d’auteurs comme Alkan et Liszt qui ont de surcroît commis de nombreuses transcriptions très réussies. Harold Truscott me semble bien résumer la question en affirmant que ce qu’on qualifie d’écriture orchestrale au piano est le plus souvent une écriture pianistique d’une très grande qualité appliquée à une œuvre de grandes dimensions qui se révèle à la réflexion toujours extrêmement difficile à orchestrer. Le deuxième mouvement consiste en une Marche funèbre en fa mineur d’allure mahlérienne. Dans l’édition originale, le titre de départ porte: «Symphonie: no2. Marcia funebre sulla morte d’un Uomo da bene», mention qui a malheureusement été supprimée de toutes les rééditions. On songe bien sûr à la suscription qui accompagne la Marche funèbre de la 3e Symphonie de Beethoven. Mais cet «Uomo da bene», ne peut-on l’identifier avec le père du compositeur, Alkan Morhange, qui était décédé en 1855, deux ans avant la publication de ces études? Le Menuet en si bémol mineur, est en fait un scherzo brucknérien avant la lettre, plein de force, éclairé par un trio lyrique. Le Presto final en mi bémol mineur clôt l’œuvre sur une course haletante. La Symphonie n’atteint pas la démesure du Concerto ou de la Grande Sonate. Mais, un peu comme la Sonatine op. 61, elle témoigne qu’Alkan était aussi capable d’écrire des pièces parfaitement équilibrées, presque «classiques». Alkans 1837 von S. Richault herausgebrachte Douze Grands Caprices ou Etudes—auch Douze Caprices oder Etudes-Caprices genannt—umfassen vier Gruppen zu je drei Stücken, nämlich op. 12, 13, 15 und 16. Es sind die ersten wahrhaft eigenständigen Kompositionen des damals Vierundzwanzigjährigen, der bis dahin, vielleicht mit Ausnahme der beiden Concertos da camera, nichts als ein paar glanzvolle, aber unbedeutende Stücke veröffentlicht hatte. In den 1830er Jahren gelangte er zum ersten echten Höhepunkt seiner Karriere, die jedoch 1839 zunichte gemacht werden sollte, wahrscheinlich wegen der Geburt eines unehelichen Sohns namens E-M Delaborde. Die zwölf Caprices zeugen von den privaten Ausschweifungen des Komponisten und illustrieren, wie er in seinem Leben stets neue Probleme anzuhäufen schien. Ronald Smith zufolge ist an diesen Stücken die stilistische Entwicklung ihres Urhebers abzulesen: Die Stimmung ist düster und zwanghaft, die Rhythmik explosiv, die ganze Klaviatur wird einbezogen, virtuose Intensität herrscht vor—alles Merkmale, die Alkan in seine späteren Werke viel kunstvoller, sparsamer und genialer einbinden sollte. Im Verlauf der vier Stückfolgen findet sich eine Vielfalt an Stimmungen: Die Trois Improvisations dans le style brillant (op. 12) sind kurz, glänzend und ein wenig oberflächlich, die Trois Andantes romantiques (op. 13) entfalten sich lyrisch in einer zeitweise unerbittlich anmutenden Atmosphäre, die Tre Scherzi (op. 16) sind mit außerordentlichen rhythmischen Effekten angefüllt, ja zeitweise gar überladen. Was die Souvenirs: Trois Morceaux dans le genre pathétique (op. 15) betrifft, so enthält diese Zusammenstellung die längsten Stücke, die dramatischste Musik, die größten spieltechnischen Schwierigkeiten und die einzigen Kompositionen mit jeweils eigenen Titeln. Was haben diese Titel zu bedeuten? Britta Schilling-Wang neigt zu der Ansicht, sie hätten eine religiöse Dimension (insbesondere „Aime-moi“ und „Morte“), obwohl man sie ebenso als Ausdruck eines sekulären Programms wie dem von Berlioz’ Symphonie fantastique sehen könnte, gewissermaßen als „bewegende Erinnerungen aus dem Leben eines Künstlers“. Die Tatsache, daß das Hauptthma von „Aime-moi“ am Ende von „Morte“ wiederkehrt, scheint die Geschlossenheit der Sammlung zu betonen, was einen vermuten läßt, das Werk sei als durchgängiges Ganzes gedacht gewesen, nicht als Gruppe eigenständiger, einzeln spielbarer Stücke. Der Geschmack dieses Neufranken ist nach einem flüchtigen Blick in das Heft zu erkennen und schmeckt sehr nach Eugene Sue und G. Sand. Man erschrickt vor solcher Unkunst und Unnatur. Liszt carikirt wenigstens mit Geist; Berlioz zeigt trotz allen Verirrungen hier und da ein menschliches Herz, ist ein Wüstling voll Kraft und Keckheit; hier aber finden wir fast Nichts, als Schwäche und phantasielose Gemeinheit. Die Etuden haben Ueberschriften: „Aime moi“, „Le Vent“, und „Morte“, und zeichnen sich auf ihren sämmtlichen 50 Seiten dadurch aus, daß sie nur Noten ohne alle Vortragsbemerkung enthalten; die Caprice möchte nicht getadelt werden, zumal man ohnedies weiß, wie solche Musik am besten vorzutragen; aber die innere Leerheit prunkt nun auch noch mit äußerer und was bleibt übrig? Im „Aime moi“ eine wässerige französische Melodie mit einem Mittelsatz, der gar nicht zur Ueberschrift paßt, im „Vent“ ein chromatisches Geheule über einen Gedanken aus der A-Dur-Symphonie von Beethoven, und im letzten Stück eine widerwärtige Oede, wo Nichts als Holz und Stecken und Sünderstrick, das letztere noch dazu aus Berlioz entlehnt. Wir beschützen das verirrte Talent, ist nur überhaupt welches da, bleibt nur etwas Musik übrig; wo aber jenes eben noch zweifelhaft und von dieser nichts zu erblicken als Schwarz hinter Schwarz, müssen wir uns unmuthig abwenden. Man hätte von Schumann mehr Einsicht erwarten mögen—er selbst hatte gerade eine Folge von Variationen über das Thema aus dem Allegretto von Beethovens Siebter Sinfonie geschrieben, die mit Zitaten aus Werken des tauben Meisters gespickt ist. Was die „aus Berlioz entlehnte“ Idee betrifft, so bezieht sich die schlicht auf das Dies irae, ein Thema, das doch um einiges früher geschaffen wurde als die Symphonie fantastique! „Aime-moi“ in As-Dur beginnt mit einer wunderbaren melodischen Phrase von wahrhaft Chopinscher Romantik. Der Dialog wird immer angeregter, die Stimmführung gewinnt rasch eine solche Schwierigkeit, daß sich Ronald Smith zu der Äußerung verleiten ließ, bestimmte Passagen seien offenbar für eine ausgestorbene Rasse siebenfingriger Pianisten verfaßt worden! Obwohl es heutzutage kaum noch gespielt wird, war „Le vent“ lange Zeit ein recht populäres Werk—so beliebt, daß Sorabji schrieb, es sei „fast zu bekannt, könnte man sagen, da die meisten Leute Alkan nur als Urheber dieses einen Stücks kennen, ebenso wie sie Sibelius nur als Komponisten des Valse triste oder von Finlandia kennen.“ Für Liszts Geschmack ist „Le vent“ „das romantischste der drei Stücke. Mittels einer ununterbrochenen Explosion chromatischer Sechzehntel ist es dem Komponisten wunder­bar gelungen, die Effekte jener anhaltenden Winde heraufzubeschwören, die manchmal tagelang wehen, so daß sie dem Heidekraut und den Gräsern im Wald ein monotones Stöhnen entlocken. Man kann fast den Regen an den Stämmen der Eichen herabrinnen hören, und voller Ehrfurcht kann man der Melodie lauschen, die über all diesem gedämpften Gemurmel schwebt wie das Lied eines Liebhabers oder des Dichters, der das Trauern der Natur betrachtet, doch ohne diesen Kummer in sich selbst zu spüren, weil er in seinem Herzen die sanfte Glut einer Erinnerung oder einer Hoffnung bewahrt“. Larry Sitsky fügt hinzu: „Ein ‘normaler’ Romantiker würde die Gelegenheit ergreifen, einen rechten Windstoß zu schaffen, doch in Alkans Komposition ist das Auf- und Abschwellen des Windes von monotoner Regelmäßigkeit, und die hervortretende Melodie hat mehr mit Pathos als mit Heldentum zu tun.“ (Alkan sollte sich diesem meteorologischen Thema in der ersten seiner zwölf Etudes dans tous les tons mineurs op. 39 noch einmal zuwenden, die den Titel „Comme le vent“ trägt—ein Werk, das nach Sorabjis Meinung längst nicht so erfolgreich war.) Die Partitur ist an sich schon recht auffällig: Das Schriftbild wird von einer riesigen Anhäufung von Noten bestimmt—wiederholten Skalen in Zweiunddreißigsteln—, und der optische Eindruck ist beinahe so verblüffend wie der Klang der Musik. Einen Effekt dieser Art haben wir auch in einigen von Chopins Etüden vorliegen. Der Mittelteil ist ohne Zweifel der lyrischste und schönste; die Kombination von Tremoli und chromatischen Tonleitern, die in der linken Hand aufblitzen, beschwört Chasse-neige herauf, die letzte von Liszts Etudes d’exécution transcendante, ohne daß wir einen Hinweis darauf bekämen, wer hier wen beeinflußt hat. Wenn man sich das Werk anhört, erscheint diese Kritik jedoch eher unpassend. Die Musik beginnt mit leeren Quinten im tieferen Register des Klaviers, und anschließend erklingt darüber das Thema des Dies irae, bis ein heftiger Schwall von Akkorden der Öde etwas Gewaltsames verleiht. Es folgt ein großartiges Lamento, das erst in eine blumige Kadenz übergeht, dann in eine Passage, in der ein wiederholtes B einen unheimlichen Vorgeschmack auf „Le Gibet“ aus Ravels Gaspard de la nuit gibt – Ravel war mit Alkans Musik vertraut. Der nächste Abschnitt, den Liszt als „Presto-Finale“ bezeichnet hat, bringt gewaltsames Aufbegehren und Ärger zum Ausdruck und kehrt dann zu der verzweifelten Stimmung zurückkehrt, mit der das Stück begonnen hat. „Morte“ erinnert ohne Zweifel an Musik von Berlioz, Mussorgski und Ravel—doch ebenso kündet es von Alkans eigenen zukünftigen Kompositionen: zum Beispiel „Prométhée enchaîné“ aus der Grande Sonate op. 33, La Chanson de la folle au bord de la mer aus den Preludes op. 31 oder Le Tambour bat aux champs op. 51 Nr. 2. Das Fehlen jeglicher Vortragsbezeichnungen in der Partitur könnte als eine Art Hommage an den Adressaten der Widmung verstanden werden. Die Aufgabe des Interpreten erleichtert es nicht gerade. Im großen und ganzen stellt diese Zusammenstellung eine Herausforderung an alle Pianisten dar. Raymond Lewenthal hat zu Recht auf der Notwendigkeit bestanden, Alkans Musik streng a tempo zu spielen, in den angegebenen Tempi und mit völliger Überzeugung, da dies keine Musik ist, die schon beim Lesen zum Leben erwacht. Statt der Ansicht von Ronald Smith zu folgen, der behauptet, der zum Spielen von Opus 15 nötige technische Aufwand stehe in keinem Verhältnis zur musikalischen Ausbeute, sollten wir lieber auf Marc-André Hamelin hören, der in seiner wahrhaftigen Neuschöpfung des Werks Initiativen ergreift, die geradezu eine Verwandlung der Partiturseiten bewirken. Alleluia op. 25 kam 1844 beim Bureau central de musique heraus. Alkan beteiligte sich damals seit etwa einem Jahr wieder am Musikbetrieb und scheint das Werk anläßlich eines Konzerts in den Salons Erard am 20. April 1844 geschrieben zu haben. Obwohl es als Konzertstück gedacht war, versetzt uns Opus 25 in eine religiöse Dimension, die im Schaffen seines Urhebers stets präsent war. Erinnern wir uns, daß „Alleluia“ sich als „lobet den Herrn“ übersetzen läßt, ein Ausruf, den Alkan in dieser von Enthusiasmus und Inbrunst widerklingenden Komposition voller Freude hervorhebt. Musikalisch ist Super flumen Babylonis ein beeindruckendes Werk, in dem Alkan den Psalm ganz getreu wiedergibt. Das Stück hat drei Abschnitte: Erst kommt ein „Quasi Adagio“ in g-Moll, angefüllt mit Anweisungen wie „lamentavole“, „sostenuto in infinito“ und „suavissimo“. Es folgen harfenartige Effekte in der linken Hand. Nach mehreren rezitativischen Passagen gelangen wir zu einem „Vivacissimo“ in C-Dur „con energia“; weitere Harfeneffekte führen zum Finale—„Allegro feroce“ in g-Moll—, in dem eine unglaublich gewalttätige Atmosphäre herrscht. Salut, cendre du pauvre! op. 45 ist Alkans einziges im Jahr 1856 veröffentlichtes Werk. Es handelt sich um eine Paraphrase auf ein Gedicht von Gabriel-Marie-Jean-Baptiste Legouvé (1764–1812), das nur schwer eindeutig zu identifizieren ist. Wie beim vorhergehenden Stück, wenn auch im Rahmen einer generell ruhigeren musikalischen Landschaft, stellen die diversen Abschnitte kontrastierende Stimmungen nebeneinander. Das Stück beginnt mit einer Reihe von Arpeggien und führt dann ein bedeutungsschwangeres Thema ein, das fortan das ganze Werk durchzieht. Es folgt ein Blatt in wesentlich traurigerer Stimmung, das mit seinem zwanghaften Pochen in der linken Hand an den Marche funèbre (op. 26) gemahnt. Das Stück kommt mit weit ausgreifenden Akkorden zu einem ruhigen Schluß. Nach dem Rückschlag, nicht als Zimmermans Nachfolger zum Klavierprofessor am Pariser Konservatorium berufen zu werden, begann sich Alkan zunehmend aus dem öffentlichen Leben zurückzuziehen. 1857 brachte Richault eine ganze Sammlung außergewöhnlicher Werke heraus, darunter auch Alkans magnum opus: die zwölf Etudes dans tous les tons mineurs op. 39. Sie sind dem belgischen Musikforscher François-Joseph Fétis gewidmet, der dazu schrieb: „Das Werk ist ein wahres Epos für das Klavier“. Die umfangreiche Zusammenstellung faßt den ganzen pianistischen und kompositorischen Wagemut des Komponisten zusammen und enthält einige seiner bekanntesten Werke, von denen wohl keines bekannter ist als Le Festin d’Esope, eine Variationsfolge, die den Zyklus beschließt. Hier finden wir das berühmte Konzert für Soloklavier, dessen erster Satz allein schon eines der großen Monumente des Klavierrepertoires darstellt, sowie die Sinfonie für Soloklavier, die sich aus den Etüden 4 bis 7 zusammensetzt und in erheblich „verünftigerem“ Maßstab gehalten ist. Der Mangel an Zusammenhalt, der sich aus der progressiven Tonalität der vier Sätze ergeben könnte, wird durch die vielen kunstvoll versteckten, miteinander verwandten Themen ausgeglichen, die alle von mehreren Autoren eingehend untersucht worden sind, u.a. von Larry Sitsky und Ronald Smith. Man könnte die orchestrale Klangqualität von Klavierkompositionen ad infinitum diskutieren, insbesondere im Fall von Komponisten wie Alkan und Liszt, die außerdem noch zahlreiche erfolgreiche Transkriptionen verfaßt haben. Harold Truscott faßt das Ganze wohl recht gut zusammen, wenn er schreibt, daß das, was in der Klaviermusik als „orchestral“ bezeichnet wird, in den allermeisten Fällen „pianistische“ Stimmführung von hoher Qualität ist, angewandt auf ein groß dimensioniertes Werk, das sich bei näherer Betrachtung als ausgesprochen schwer zu orchestrieren erweist. José Vianna da Motta hat genau die richtigen Worte gefunden, um den umfangreichen Kopfsatz der Sinfonie zu beschreiben: „Alkan’s sicheres Formgefühl zeigt sich glänzend in dem ersten Satz der ‘Sinfonie’ (No. 4). Dieses Stück ist so vollkommen in seinem Aufbau, so harmonisch in seinen Verhältnissen wie ein Sinfoniesatz Mendelssohn’s, vor dem er aber eine tiefere Leidenschaft voraus hat. Der Charakter ist so gut getroffen und durchgeführt, dass man beim Hören das Stück Note für Note in Orchesterklang umsetzt: Aber nicht nur klanglich, sondern auch im Styl, in der Art der Polyphonie ist das Orchester greifbar gezeichnet.“ Die Kompositionskunst selbst, so Vianna da Motta weiter, werde in diesem Werk transformiert. Der zweite Satz besteht aus einem Trauermarsch in f-Moll, der vom Stil her an Mahler denken läß. In der Originalausgabe hieß es auf der Titelseite: „Symphonie: No. 2. Marcia funebre sulla morte d’un Uomo da bene“—was in allen folgenden Ausgaben leider ausgelassen wurde. Natürlich wird man an den Untertitel des „Marcia funebre“ in Beethovens Dritter Sinfonie erinnert. Wer dagegen käme umhin, in dem besagten „Uomo da bene“ Alkans Vater Alkan Morhange zu erkennen, der 1855, also zwei Jahre vor der Veröffentlichung dieser Studien, verstorben war. Das Menuett in b-Moll ist in Wahrheit ein Scherzo, das Elemente Bruckners vorwegnimmt—voller Energie und erhellt durch ein lyrisches Trio. Das abschließende Presto in es-Moll, von Raymond Lewenthal denkwürdig als „Höllenritt“ beschrieben, bringt das Werk zu einem atemlosen Schluß. Die Sinfonie enthält keine solchen Exzesse wie das Konzert oder die Grande Sonate. Hingegen beweist sie ähnlich wie die Sonatine op. 61, daß Alkan auch imstande war, durchaus ausgewogene, beinahe „klassische“ Werke zu schreiben.